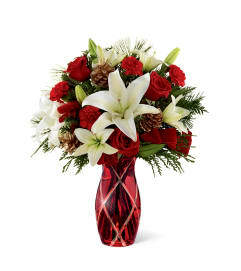 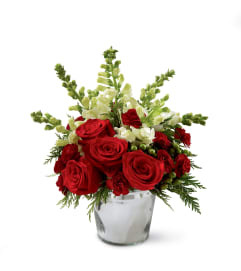 Beautiful, bright, and blooming with a broad holiday appeal, this gorgeous Christmas flower bouquet is simply enchanting at every turn. 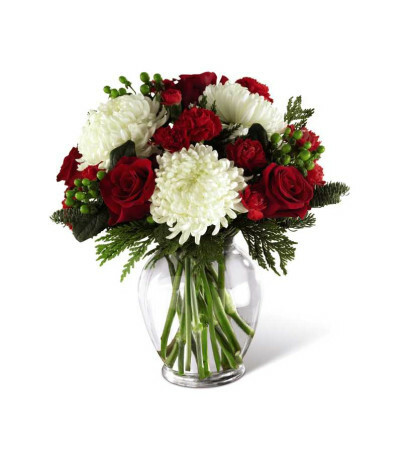 Gorgeous and full white snowball chrysanthemums are not to be upstaged when arranged amongst rich red roses, red carnations, and red mini carnations, accented with red hypericum berries and assorted Christmas greens to create a standout yuletide display. Presented in an attractive clear glass vase, this gift of flower is ready to create a treasured holiday moment for your recipient.